CANTON, Mass. – The final score was in no way indicative of the type of game it had been, but the end result was the same as last year for Mansfield against Xaverian in the opening round of the Div. 1 South tournament at the Canton Ice House. The Hawks tacked on three goals in the final 1:02 of the game, including an empty net goal and one with six seconds on the clock, to add gloss to a 6-2 scoreline and knock the Hornets out of the playoffs for the second straight season. Mansfield (9-7-5) came into this year’s game as the nine seed and Xaverian as the eight, a reversal of last season, and the game played out as these match-ups typically do. The game was end-to-end, hard-hitting, and tight. Ryan Pomposelli had the game’s first chance straight off a draw but his point-blank effort was saved by Mansfield goalie Sean McCafferty at the near post. Two minutes later, the Hornets nearly took the lead with a shot from beyond the blue line by Jake Lund that took a slight deflection in front and turned into an awkward blocker save for A.J. Scott, who played at Stoughton last year. McCafferty came up with a kick save to deny Ross Vona midway through the first and Scott was called upon to stop a backhanded effort by Cullin Anastasia. With four minutes left in the first, the Hornets took advantage of a power play opportunity to take the lead. Tyler Oakley’s shot from the point was tipped in front by Patrick McCafferty, giving Scott no chance. The lead was doubled early in the second. Freshman Matty Copponi skated past his marker on the left side of the goal and attempted to saucer a pass in front to Coleman O’Brien but instead, the puck took a deflection and slid under the pads of the Xaverian goalie. There was a delay before the officials signaled for a goal and then Scott argued that the net had been dislodged prior to the puck crossing the line. After a conversation between the officials, the goal stood and Mansfield had the 2-0 advantage. The Hornets could have added a third on two occasions. Dylan Tivnan forced Scott into a shoulder save with a wrister from the left circle after a quick transition and then Anastasia put the puck into the crease where a scrum of bodies was located but no one was able to find the necessary touch to knock it in. Xaverian had speed to bother the Hornets, but generally, the defensemen, led by Tim Arnold and Oakley, were able to keep the Hawks to the outside and limit their chances. With 1:16 left in the second, Xaverian finally managed to get on the board. Pomposelli got a third bite of the apple from the edge of the crease and managed to lift it over the leg of the sprawling McCafferty, who had already made two saves in the sequence. The goal gave the Hawks a little energy, but they took a penalty that appeared to give the impetus back to Mansfield. Unfortunately for the Hornets, a mix-up on an offensive zone face-off led to a tying goal. The puck could not be held in at the blue line and Josh Barton was on it in a flash, creating a shorthanded breakaway that made it 2-2 with just 15.2 on the clock. The momentum carried over into the third period. Xaverian quickly took control again and Austin Ricker was forced to give up a power play in order to stop a breakaway opportunity. On the power play, the Hawks crashed the net and, again after a couple of McCafferty saves, Matt Ryan was able to punch across the go-ahead goal. Mansfield was struggling to create scoring chances against the organized Xaverian defense, which was clogging the shooting lanes. The Hornets only put five shots on goal in the third, although Patrick McCafferty did have a breakaway chance with six minutes to play that was saved by Scott. With 1:02 remaining, as people were waiting to see when Mansfield would pull its goalie, Xaverian got a quick breakout of the zone and Matt Talarico scored to seal the win. An empty netter and a goal with barely any time on the clock would make the score far more lopsided than was the action on the ice. FOXBORO, Mass. – Sometimes even the top teams need a friendly bounce every once in a while. 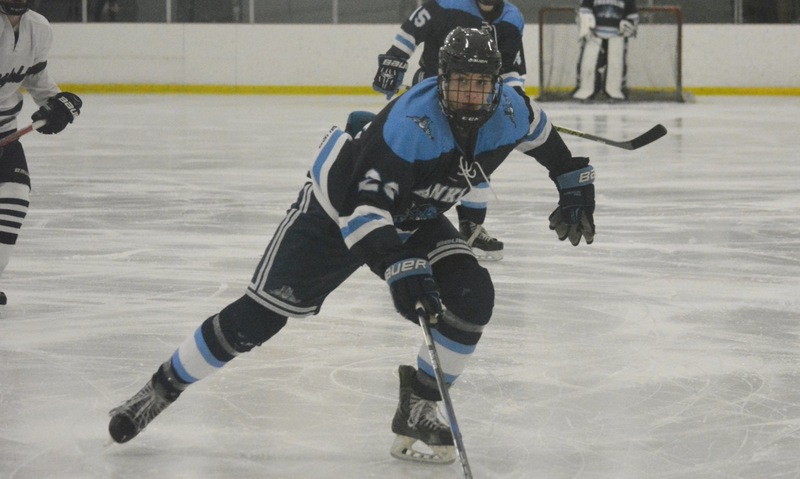 With Saturday afternoon’s game at the Foxboro Sports Center tied at 2-2 early in the third period, Franklin senior Noah Nasuti turned at the blue line and flung a puck on net. It landed a few feet from goal and bounced on its edge and slid past Mansfield senior goalie Tony Rullo, who finished with 28 saves and had a strong overall game to keep the Hornets in it. That bounce allowed the Panthers, who seemed nervous at times in the attacking zone, to breathe a little easier. Two late goals, one on the power play and the other into an empty net, sealed a 5-2 victory for Franklin and put an end to a two-game losing streak. Everyone came into Saturday’s game thinking that Franklin was going to come out flying, motivated by last weekend’s state final rematch loss to St. Mary’s (Lynn) and the shocking loss to Taunton in midweek, which was the first loss for the Panthers in the league since the 2013-14 season. Franklin had not lost twice in the Hock since 2012-13. Rather than Franklin asserting itself in the first, it was Mansfield that came out stronger and took the lead inside the first five minutes. James Bezeau fed a pass from the half-boards into the middle to a streaking Cullin Anastasia, who had a step on his defender and then slotted his shot five-hole for the opener. Franklin had several chances in the first period to try and get the game on level terms. Nasuti had a good chance knocked down by Rullo, Luke Downie had a wrist shot from the left circle snagged and in the final minute Brendan O’Rielly had a one-timer from the slot saved by Rullo as well. The Panthers picked up the energy in the second period and started to control the play. Downie created a scoring opportunity on the forecheck but shot it into the chest of Rullo. Downie set up James Kilroe for a point-blank chance a couple minutes later but the shot was partially blocked and covered. Mansfield almost doubled its lead against the run of play when Patrick McCafferty got behind the Franklin defense but his backhand effort was kept out by a combination of Owen Ginley’s shoulder and the post. Rullo then came through with a huge stop, going post-to-post and stretching out a pad to rob Adam Assad after a give-and-go with Jeremy Miller. 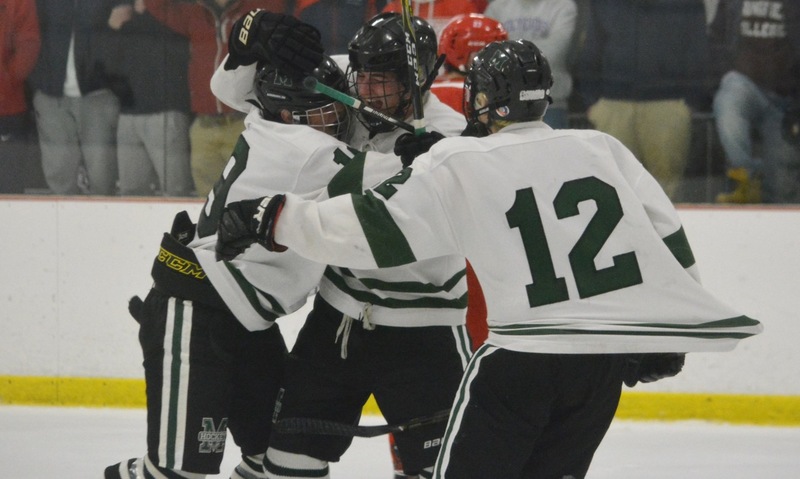 The pressure eventually paid off for Franklin with freshman defenseman Colin Oppelt having a shot from the point tipped by Kilroe and the rebound cleaned up by O’Rielly to tie the game. Just 10 seconds later and it was the Panthers in front after Dan Magazu sliding a shot under Rullo’s pads, assisted by Kenny DeMerchant and Jack McGrath. A minute later, Mansfield tied the score again. After a scramble in front of Ginley, freshman Chris Jenkins got the final touch (Cullen Murphy was credited on the score sheet) to make it 2-2, despite the Hornets being outshot 12-7 in the period. Franklin got the break it needed 2:24 into the third period, when Nasuti saw his shot find the back of the net. The Panthers were on top on the scoreboard and on the ice, but Mansfield had its chances to get back into the game. Matt Farragher twice in the span of a minute came flying down the right wing and had a shot from the edge of the circle but Ginley (22 saves) was able to glove one and stand tall to stop the other. Franklin doubled its lead on the power play with 2:09 remaining. Assad pushed the puck to Miller behind the goal and dashed to the net. Miller passed it back out in front and Assad roofed it for a 4-2 lead. O’Rielly made sure of the two points with an empty net goal (his second) in the final minute. 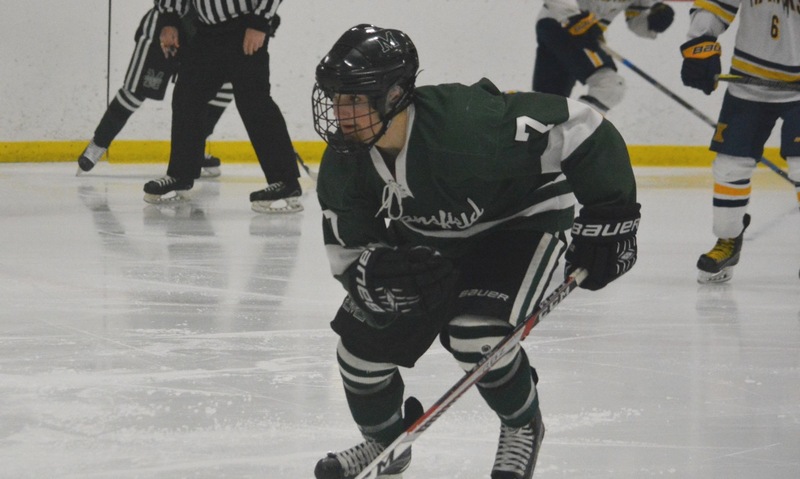 Franklin (7-4, 2-1) will be back in Foxboro on Wednesday to face the Warriors, while Mansfield (5-4-1, 2-1) will be on the road to face Oliver Ames.